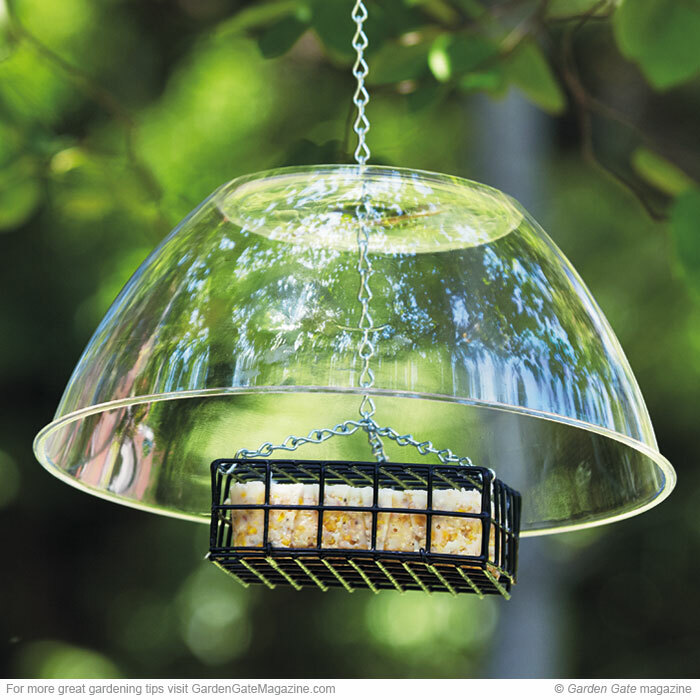 To keep squirrels from eating at your suet cage, try a simple baffle using a hard plastic mixing bowl — deep enough to cover the cage. With a long-handled, multipurpose lighter, melt a hole, wide enough for the chain and hook, into the center of the bottom of the bowl. Then rehang the cage with the baffle in place. To secure the bowl above the feeder, insert a nail into a link in the chain. Agile birds, such as nuthatches and woodpeckers, can fly under the bowl to perch inside. But squirrels don’t have anywhere to jump onto or hang from to reach the suet.